The Trail Conference has adopted and maintains 30 of the 32 lean-tos located in the Catskill Park in partnership with the New York Department of Environmental Conservation (NYSDEC). These backcountry lean-tos provide shelter to day hikers and overnight backpackers alike in the Park and help to minimizing distress to the surrounding environment by focusing locations for overnight stays. Our Catskills Lean-to Repair, Rehabilitation and Reconstruction Program has been a key initiative of our Catskill Trail Programs since 2011. The program began in 1999 with the repair of several lean-tos and the reconstructions and replacement of the John Robb Lean-to on Hunter Mountain. We have completed rehabilitation projects at the Mink Hollow Lean-to, the Echo Lake Lean-to, and the Diamond Notch Lean-to. More recently, in 2012 at the Mink Hollow Lean-to in the northern Catskill Mountains, the Trail Conference, the Catskill 3500 Club, supporters of the Chris Nowack Memorial Fund, and the local Forest Ranger, Christine Nelson, hiked up more than 700 pounds of cedar shingles, lumber, and other materials to the then put on the new shingles, put down the new floor boards, re-stained the sides of the lean-to, and stained the new lean-to floor. Thanks to a generous gift by REI in 2013, the Trail Conference has additional resources for planned work (full story). Ongoing projects in the region include the rehabilitating the Devil's Acre Lean-to, rebuilding the German Hollow Lean-to, privy replacement at a number of different locations and the planning for new potential lean-to locations. Most general maintenance and upkeep of our lean-tos are done by individual volunteers who adopt a lean-to through the Trail Conference. The adoption process is similar to that of a trail maintainer adopting a segment of trail except that a Lean-to Caretaker is in charge of a Lean-to instead of a trail. Lean-to Caretakers are in responsible for of many aspects of the maintenance of the lean-to and follow the “General Duties of an Adopter” in order properly care for the lean-to and meet the standards set forth by the NYSDEC. These responsibilities include inspecting the shelter for damage, vandalism, rotten logs, cleaning up any litter and cleaning out/rebuilding the fireplace of the shelter. Like with trail maintenance a lean-to adopter visits their lean-to three times a year (spring, summer, and fall) to perform the maintenance and check on the condition. Lean-to Caretakers have a special connection with their lean-to and feel a sense of pride knowing that their efforts help many people have a safe dry place to stay while on their hiking trips. Some Caretakers have maintained the same lean-to for years and love the satisfaction it gives them. There are even those Caretakers who as a child camped at a lean-to and have now adopted that same lean-to to continue building new memories there. Our volunteer Lean-to Caretaker Program is managed by a volunteer Lean-to Chair who is responsible for collecting reports from individual caretakers, monitoring lean-to conditions, reporting to the NYSDEC and organizing Lean-to Crew worktrips to repair and reconstruct lean-tos and privies. If you are interested in adopting a lean-to, more information on our Lean-to Caretaker program is available here.Caretakers, coordination with the NYSDEC and managing our Catskills Lean-to Crew. 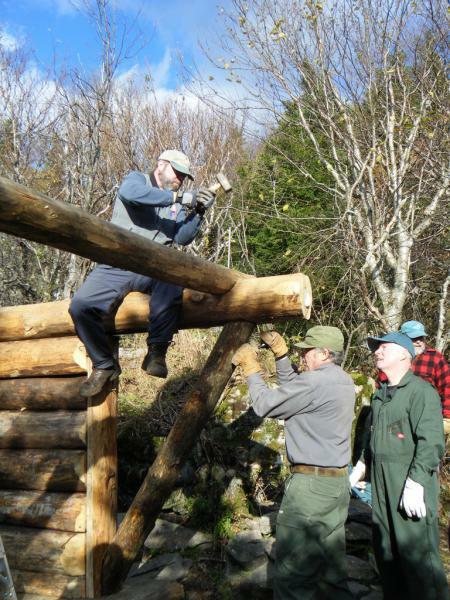 While Caretakers handle general maintenance duties, when a lean-to is significantly damaged or in need of repair, the Trail Conference has a Lean-to Crew in the Catskill Mountains that can repair and reconstruct lean-tos. 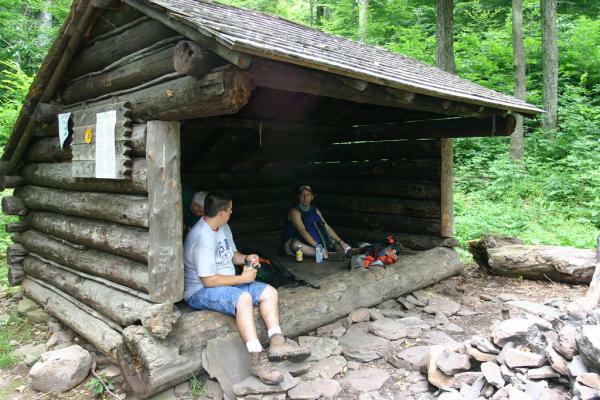 Crew work in the past has included the reconstruction of the John Robb Lean-to and repair projects on a number of lean-tos throughout the Catskill Mountain region. Lean-to Crew Trips are included on the Trail Conference's Trail Crew Outings Calendar. You can also join the mailing list for general Catskill Mountain region trail information by sending an email with your name and address to [email protected] expressing interest in the Catskills Lean-to Crew. Help us help the Catskill Park's lean-tos! Lean-to maintenance, repair and reconstruction require lots of labor, materials and support from Trail Conference staff. If you are unable to volunteer on a crew or adopt a lean-to, but still want to help, please consider supporting our lean-to program in the Catskill Park by donating to the Trail Conference and your donation will be put to work on the trails, lean-tos and bridges of the Catskill Mountains and Catskill Park. German Hollow and Batavia Kill Lean-to Rehabilitation Project - New volunteers are welcome and no prior experience is necessary. We will be building the lean-tos on the grounds of the Catskill Interpretive Center. Once the structures are completed, they will be disassembled and packaged into bundles for delivery via helicopter to their final sites. If you are interested in this project please contact our Catskills Regional Office at 518-628-4243 or email us at [email protected]. 6/11/2013 - MAHWAH, NJ: Outdoor equipment retailer REI has announced a $10,000 grant to the Catskills Lean-to Repair, Rehabilitation, and Reconstruction Program operated by the New York-New Jersey Trail Conference. This grant will allow the Trail Conference to expand its program of improving, repairing, and rebuilding 29 lean-tos and their privies along the 200 miles of Trail Conference-maintained trails in the Catskill Park. The Trail Conference currently maintains 29 of the 32 lean-tos in the Catskill Park. Solidly built lean-tos and privies provide backpackers and day hikers with safe on-trail shelter while minimizing distress to the surrounding environment by focusing locations for overnight stays. Read the full story. Work was completed on one weekend in October of 2012 and we lucked out with two days of perfect weather. Saturday morning volunteers from the Trail Conference and the Catskill 3500 Club, supporters of the Memorial Fund and the local Forest Ranger, Christine Nelson, brought up over 700 pounds of cedar shingles, lumber and materials to the Mink Hollow Lean-to site from the end of Mink Hollow Road. Many of us, including Christine the Forest Ranger and several volunteers made 5 to 6 trips back and forth bring up material. Also on Saturday we were able to remove the old cedar shingles, start the first few rows of new shingles and put down the new floor boards. On Sunday we finished installing the new roof and re-stained the sides of the lean-to and stained the new lean-to floor that we had installed on Saturday. All in all, it was a great two day project made all the more special by having supporters of the Memorial Fund working on the project. We were able to learn more about Christopher, his love of hiking in the Catskills and the love of his family and friends following his untimely passing. Thanks to so many wonderful volunteers, a brand new John Robb lean-to was built in 2009 and in 2010 we rehabilitated the Diamond Notch lean-to, which was in desperate need of a new roof and floor, among other improvements. The executive committee of the 3500 Club generously agreed to fund the project.